Finally, no more hailing, hand-waiving, and waiting in line for bad-smelling taxis and their impolite drivers. Uber is like a private chauffeur you can summon via an app. Download the app (for iOS, Android, or BlackBerry), punch in your credit card info, complete the sign up, and prepare for a comfortable, premium-feeling, safe, and stress-free ride to your chosen destination. Your personal limo drives to where you are. Out comes a driver – polite, clean, well-mannered – who opens the door for you. The interior is soothing, quiet, comfortable. There’s no arguing at the start (you can have the driver take the most efficient route or a scenic one, just as you please) and no haggling at the end of the ride (the calculated rates and your credit card will handle that). Here’s what you DON’T get: a stop-and-go, need-for-speed, swerve-oriented ride helmed by ranting man behind the wheel. Here’s what you DON’T hear: the blazing local radio from a cheap speaker behind you and the now-and-again structural groans of a car maybe past its prime. Here’s what you DON’T do: stay alert for four mosquitoes happily buzzing about and for the taxi’s sudden acceleration and G-force-inducing turns. Here’s what you DON’T see: a taxi driver you want to strangle, the taxi meter’s blinking digits (maybe it’s broken), your watch (you’re late), the turn you just missed (you’re lost, but the driver has a shortcut only he and God knows). During an Uber ride, you feel good about yourself, and about the day ahead or the evening that’s about to end. And you wonder where this app, this service, this car, this experience, has been. All your life. Uber is a software company (which is why one major focus is what and how well their app delivers) that connects clients and transportation providers (fleets or private individuals with cars) through a transport app (the Uber app). Uber vehicles in the Philippines, as of this writing, consists of Toyota Camry, Hyundai Sonata, Honda Accord, Mercedes, Toyota Altis, and Honda Civic. Uber users get charged, through their credit card, a minimum of P120 and a succeeding P12 per kilometer. But rates can go up – the term for that is “surge pricing” – during high demand scenarios such as bad weather and rush hour. 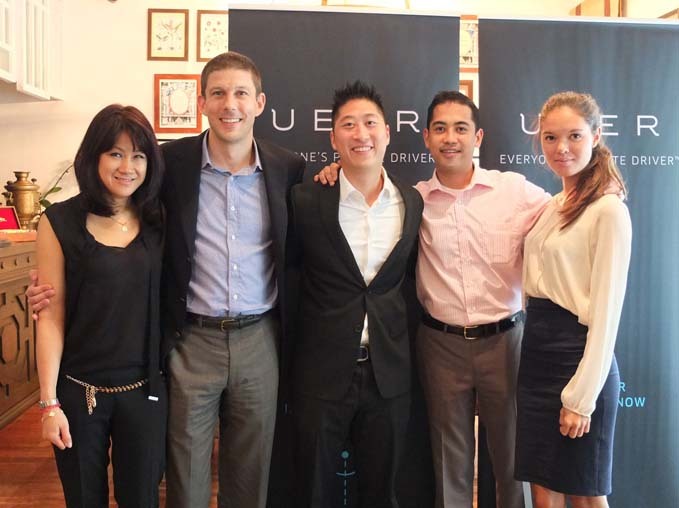 Uber executives at the Manila launch. From left to right – Claire Ngo (Advisor), Mike Brown (Regional Manager), Douglas Ma (General Manager), Mikel Weigel-Canete (Operations Manager), Christine Dahl (Community Manager). …you get P300.00 off your first Uber ride. You can redeem it at uber.com/invite/7h16c. So there it is. Uber, your personal driver, awaits.